In today’s global economy, where most businesses are aiming to capture international markets, bridging cultural and lingual gaps is not a choice but a necessity. However, there are some industries that have a far greater need for multilingual capabilities than others. Travel and Tourism is one of them as they naturally cater to consumers from diverse cultural backgrounds. Most travel and tourism companies facilitate online reservations and have detailed self-help sections on their websites but travellers may want to talk to a customer service rep for all sorts of reasons. Travel is usually a big-ticket item, and people want to be certain that they understand everything before they make the purchase and get it right. Sometimes they are looking for more details than what is available on the website, sometimes they simply want to talk to a human rep! People usually like to speak with a rep before making changes online themselves. This is also because of the stringent policies pertaining to cancellations and changes in travel space that can entail heavy financial penalties. When travellers are booking online from afar, they need assurance that the website they are purchasing from is legitimate. They may be travelling to a foreign land and will understandably have numerous questions. 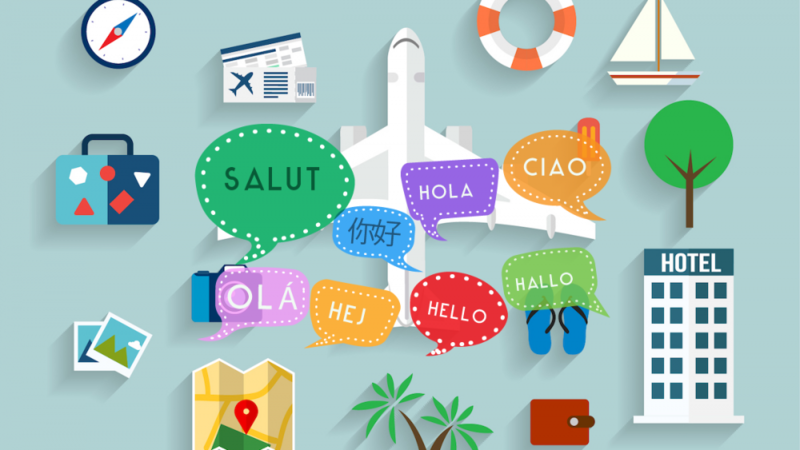 To make sure that they get the best experience possible, they want to talk to a rep about what they are buying, the specifics of the tour package, the particulars of an activity or experience, the fare rules of air ticket but this cannot be achieved if your customer and your rep don’t speak the same language. If your rep talks in English and the only language your customer speaks and understand well is Italian, you are leaving the immense scope of miscommunication leading to further complications. Presenting the information to the customer in their native language makes sure that you are both on the same page and induces confidence in your customer that they won’t regret their purchase. Travel is highly logistics intensive and things can and do go wrong unpredictably and suddenly. A flight could be overbooked or hotels may shut down due to flood. In such situations when panicky customers contact your customer support, the last thing they want to do is having to explain them in a language that is not native to them, even though they can speak English. Similarly, when they need to cancel or make changes due to a personal problem, they would much rather speak with someone who understands their native language. At a critical juncture like this, you don’t want your customer to struggle with communication gap and make things worse for him. Translations tools cannot be the mainstay of multilingual support. No matter how good the translation tool is, it can at best produce the literal translation which is grammatically correct, that too is optimistic. The current available technology cannot yet imitate how a human being converses. Selling travel is not like selling just another product. You are convincing your customers to go somewhere, do something and asking them to trust you to craft the right experience. The way a native speaking rep can paint a verbal picture of what you are offering using the right tone of voice, emotions and context, cannot be achieved with machine-translated text, at least not with the current technology. Hiring and maintaining Multilingual staff in-house can be an expensive, time consuming and a cumbersome affair. Using freelancers around the world has potential management and quality problems. Engaging an outsourced call center that specialises in Multilingual support can solve a lot of these problems. You should not treat Multilingual Customer Service as a cost center but as a profit center. After all, customer service is an essential part of the customer experience and if done right, it can be the key to getting new customers and retaining existing ones for the lifetime. At LiveSalesman, we truly understand what it means to be an international business and to connect with people in their native language. We have helped a lot of our clients on their global expansion journey to internationalise and localise their customer service and navigate the path to success. With a capability to deliver call center solutions in over 30 European and Asian languages, we are always excited to help businesses find new ways to dominate the international markets. Currently, we offer Call Center Support in Spanish, French, Portuguese, German, Russian, Arabic, Chinese, Korean and Italian to name a few. Connect with us and accelerate your international growth!